A large part of so-called “conservative” Catholicism is committing a very serious error: in order to save what remains of the Catholic presence in the world, to render the mission of the Church stronger in secularized society, and faced with the moral weariness of many ecclesial sectors, it is making an effort to increase Catholic pride, by focusing totally on the Pope. Moreover, it is handling this attention on the Pope in exactly the same way as the newspapers, television and internet sites, who are extolling the humanity of the Pontiff, underlining with pride the popular interest in his person. They are behaving in the exact same way as the world devoid of faith or not concerned with faith, with their descriptions of oceanic gatherings around the Vicar of Christ, of his impressive gestures and the controversial choices that he seems to be making. No, it is not from the Pope that we need to start in order to save our Catholic life: in fact, not from the Pope at all, but from the Holy Mass, from the Holy Eucharist. So that we can explain ourselves, we turn to one of the most important spiritual authors of the of the last century, Dom Chautard, Abbot of Sept-Fons. Don Chautard to Clemenceau: “I will set about answering your questions: What is a Trappist? Why did you become a Trappist? And in order not to overdo it, I will settle for this argument: a religion which has the Eucharist at its base, must have monks devoted to adoration and penitence. "The Eucharist is the central dogma of our religion. It is called the generating dogma of Catholic piety. It is not the papacy, as you seem to think. "The Papacy is nothing other than the word-bearer of Christ. Thanks to the Papacy, the faithful keep the dogma and morality taught by Jesus Christ intact. It is this protection that keeps us on the right road, precisely marked out by our Divine Founder. But it is only Christ that remains, the Way, the Truth and the Life. "Now, Christ is not a Being who disappeared someplace we do not know of, nor even the far away Being that we think of. He is alive. He lives among us. He is present in the Eucharist. And this is why the Eucharist is the base, the centre, the heart of religion. From whence comes every life. Not from anywhere else. It is clear then, the central dogma of Christianity is the Holy Eucharist, everything starts from there, not elsewhere…and if faith diminishes in the central dogma, in the Holy Eucharist, everything in Christianity and in the Church will collapse. Has it not been like this these past years? Let us think of our churches, with Christ there “abandoned.” Everything has been done to hide the tabernacle from view; it is hidden in some other inferior places, with the excuse that the faithful would be able to adore better. And, when the tabernacle is left in the centre of the church it is all covered up by everything and anything: with tables for the New Mass and with a load of junk, which simply reveals, besides bad taste, the mental untidiness of Catholicism these days, that has certainly not made the Eucharist the central dogma of the faith. Let us think of the of genuflections and contemplation which have practically vanished from the churches. Inside the church it is necessary to keep silence always, as God is present in the tabernacle. It is He who makes our prayer true, not our bustle and din. Don Chauthard, though, in his long discourse with Clemenceau, speaks of the Mass, let us listen to him. “Mass is the Divine Sacrifice of Calvary, which is reproduced every day amidst us. Everyday, Christ offers His death to God, through the hands of the priest, exactly as in Heaven in the Mass of Glory, He presents, the glorious scars of His wounds to perpetuate the redeeming efficacy of the cross, to His Father. Everyday, at Mass, Christ renews His immense work of redemption for the world. “And to this event, the greatest that can happen on earth, more important than the noise of armies, more beneficial than the most fecund of scientific discoveries, you think we could be present at [this] without the quivering of our very being. You cannot get used to the Mass. Or what would our faith amount to? Dear brothers and sisters, is this faith really experienced in the majority of our churches? Is the Mass still intended as the Divine Sacrifice of Calvary? Who speaks with this clarity of the Mass [anymore] besides the so-called “traditionalists?” Is there anyone still around who expresses himself in this way when speaking of the Eucharist? Also here, what Dom Chautard said is repeated: the centre of Catholicism is the Eucharist, it is the Mass; The Council of Trent by fixing definitively these canons of the rite had erected a barrier to save the integrity of the Magisterium. So, it has dramatically come about, that meddling with the canons of the rite everything went [down] together - nothing remains intact in this “new” Catholicism. Martin Luther had said it: do not waste time attacking the Papacy, combat the Catholic Mass and the Papacy will collapse with it. 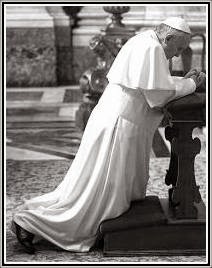 It is for this, for love of the whole Church, of Her doctrine and discipline, for love of the Pope, Vicar of Christ on earth, we are called simply to keep the rite of the Mass as it was fixed by Trent and Saint Pius V. There is nothing more urgent [to be done] so that the Church and the Pope may live. *Translators note: in the Italian version of the Brief Critical Study (letter to Pope Paul XI) quote – “magistero” is the last word. In the English version the word “Mystery” was found. Magisterium was kept because the Fathers who wrote this article pick that same word up in the following paragraph. Very good article. I am reading Newman's "Letter to the Duke of Norfolk" this weekend, and there he writes: "Though the Pope comes from Revelation, he has no jurisdiction over nature." This should be obvious to every Catholic, but sadly it is not. The NCR crowd claim Newman was hijacked by the Vatican two years ago, but his idea of conscience isn't even on the same planet as theirs. Love the Pope? Yes, even to the point of dying for him. But it's not because of who he is as a man, but because of whose message he brings to us when he upholds THE Faith. The "form"(tradition) of the Holy Mass is not the substance(Tradition) of the Holy Mass. This is the grave error that recent Popes have pointed out, especially to the SSPX. "He is present in the Eucharist. "And this is why the Eucharist is the base, the centre, the heart of religion. From whence comes every life." Thank you for this Adfero! The U.S. roots in loam. That put all else to shame. The fields of timeless Rome! The Mass is in the state that it is because of the actions of Pope Paul VI, and to the effective ratification of those actions by his successors to the present day. Focusing on the Mass's decadence rather than the source of that decadence, being wrong in theory, can lead to nothing profitable in practice. The reform of the liturgy is an exercise in delusion if it pretends that the problem does not reach across the threshold of the papal apartments. Yes. The Real Presence of Christ in the Holy Eucharist is, and must be, the supreme and only centre of all worship. The modern tendency to overemphasize the person of the pope is understandable. It's for the same reason why EWTN became so popular when it was born. What else are you going to do if your pastor or your bishop is a Modernist? Agree Martina, @Unknown absolutely did nail it. Excellent article! These priests are indeed a joy to read. It is obvious that they love Our Lord. It is quite clear that the priests referred to the origins of the abuses in the Mass with the paragraph about protestantisation and the quote from the Brief Critical Study. This is an editorial and a wake-up call - not a disertation on the breakdown of the Holy Mass. And if you visit their site - you can see that these priests are totally coherent and day after day are sticking their necks out for the love of God and His Church. May God continue to bless them abundantly! Is this the same Dom Chautard of The Soul of the Apostolate? Cain's sacrifice was not accepted by God, and is not being accepted by Him now. Hence, the Church is in a mess. That reference to Luther's comment on the Mass and the Papacy is very striking. Could you provide the source of it and/or the original quote? Thank you! Very interesting article. So, my question is not precisely on topic and I will therefore completely understand if you choose not to reply or even allow it to be posted. However, I am asking anyway. I recently red the Letter that Cardinal Ottaviano is reported to have sent to H.H. Paul VI concerning the NOM. The particular translation I read came from the EWTN Library archives. After reading it, I noted a few (just a few) strained passages and I am left wondering whether their translation be accurate. Do you have any knowledge therein? The incautious celebratory focus on the Pope is an error. It seems to me more a focus on Francis than on 'the Pope', but the point sustains. What isn't said here, and rarely said at all, is that the enthusiasms and signalled intentions of the current pope, from what I see are the same enthusiasms of most Catholics in the pew. An overwhelming majority loves the vernacular mass, that good, democratic liturgy. They love its quickness, its lightness, its room for the joke. They love its 'freedom'! They love feeling themselves as joined with their neighbor Methodists, Lutherans, Presbyterians. They love the cultural cohabitation with modernism, an accomodation now virtually institutionalized. We are modern people! They don't WANT another way, an older, harder way. The very idea of an Old Mass, an Old Catholicism, is itself an imposition, a rod against a now long enjoyed complacency. A dumbed liturgy creates a numbed people. No longer a people set apart. Were Rome to thunder once again in our age, would Catholics heed? Francis-olotry is more symptom than problem. God help us. I grew up with the Novus Ordo only. I responded to the Ordinary in Latin since 1978, I placed myself at Mass according to the ancient teachings of the Church, while ignoring the sad modernist atmosphere. I positioned my soul as if I were at a grand Tridentine Mass. So my soul profited a great deal from Christ's Sacrifice. It was always spoken of that the Mass was in great need of reform. When I attend a TLM I look for what exactly needed reform and I always come to the same conclusion. It was in need of absolutely no reform whatsoever. I wonder how men in Christ's Church could take something as perfect as the Mass of St. Pius V, destroy it, and then call it a great improvement. Men in the Church must stop lying to themselves and admit they gravely erred in destroying the sacredness of the manner in which Mass was said. This is the first time I have ever spoken of what has always been deep within my soul concerning the reform of the Mass. Gary Potter wrote an article defending Obama during the Notre Dame scandal, so I'm not surprised that he's now defending Pope Francis and criticizing Trads. I have great respect for the past writings of Mr. Potter, but he seems to have lost touch with reality lately. A very accurate assesment of our current situation! However, because the Lord is God, He can work even thru vastly inferior means. There is, no doubt, grace and sacrament in the Church at large, however, it is much more diffucult to discern in an often frivolous liturgical setting. In the 'spirit of collegiality' I will wait to hear what my local bishop has to say. So far no one else in my diocese has heard anything about this, priest or lay person. "What else are you going to do if your pastor or your bishop is a Modernist?" Indeed, so much of the adulation given to John Paul II, Francis, etc. has something to do with the absence of real Catholic leaders in our dioceses and parishes. Potter's rant at angelqueen is just that, a rant. While it is unfair to overly judge Pope Francis, who has actually done little if nothing of consequence to date (is this a surprise? ), it is likewise unfair to judge his critics. They want a Protestant Church? Please. This canard is so overworked in Catholic circles it is pathetic. Oh how I wish the Popes would be as doctrinally vocal as many Protestants nowadays! Rome's most obvious gifts is for prolixness in a soundbite age that needs precision. Leave it to a Trad to speak clearly, straightforwardly and get rapidly to the point! All of you courageous and wonderful commentors inspire me. You remind me of my strong Catholic Dad, who died very young. In the early 1950's,when I was a tiny girl, he spoke to me just as all of you speak here, with great clarity. I'm a convert, and mostly because of clarity spoken by Trads like all of you who are open to Grace. God love you all and thank you. My children all know that The Faith is more important than any pope. Since we may live through many papacies - I'm on my 7th now and only vaguely knew the first two. Following have been a procession of liberal modernists (except perhaps JP I). The choice is between postmodernist popolatry and Roman Catholicism nowadays. I reject the universal salvation and obsessive ecumenism with inculturated liturgies of John Paul II while I totally reject almost everything Pope Paul VI tried to achieve for the liberalist movement from the 1950s (as an untrustworthy Cardinal of Milan) to the 1970s when he died. As for the erudite & cautious Pope Benedict XVI, he may have issued his SP which has clarified but also made complex many liturgical issues, but he was always a liberal in the very true sense of the word and could only be understood from this vantage point. Most neo-Conservatives were unable to do this because they did not read his works or follow his career. Pope Francis is giving us quite a ride for our proverbial money. It is not all totally adverse but he is extremely liberal verging leftwards. I made sure my children knew little about his appalling misrepresentation of Catholic liturgy in Brazil. He is a minimalist but somewhere in there we can hope that Sacred Tradition will flourish in its own particular manner in spite of his pontificate. It is no use looking for much that is different these days. Pray he leaves us alone, at least. 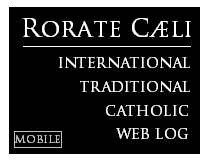 Nonetheless, it is possible to be a Roman Catholic at present however difficult this may be most of the time. Yeah well it hasn't and it won't.